In the summer of 2014, an extraordinary celebration was held in the auditorium of the Church of Christ at Laimer Platz in Munich: two churches became one. This event had seemed unthinkable for decades. The union of a "Church of Christ" with an "International Church of Christ" in Munich attracted worldwide attention. For both movements have a common history rooted in the Restoration Movement though a distinctly different history ensued: the International Church of Christ (ICOC) split off from the U.S. Churches of Christ (CoC) in the late 1970s complete with disputes, mutual mistrust and judgements. The ICOC accused their mother community of "not being committed enough"; the CoC in turn called the split-off movement a "youth sect". Communications ceased. This was the case in Munich, as well, where there were local congregations of both Churches beginning in 1989. That changed in 2004 when Reiner Kallus, former preacher of the original Church of Christ, picked up the phone. "I had recently been in the US to thank the congregations that support me financially. In Atlanta, I witnessed two families being welcomed into the church who were previously members of an ICOC. The elders later asked me if I was in contact with the ICOC in Munich. I said no and they encouraged me try to get in touch in order to seek unity." The two then pastors of the Munich ICOC, Micha Brück and Bernhard Georg, were pleasantly surprised by the call and agreed to a meeting with Reiner Kallus and his son Stephan, who was also a preacher at the time. This turned into a regular biweekly meeting where the four spoke about biblical understanding and differing points of view. "We came very close very fast. It gave rise to trust," recalls Micha Brück. They also talked about the injuries which had been inflicted, for which they all apologized and, wherever possible, changed congregational practice. Soon, due to the agreement they found in crucial theological questions, the four stated: "We are spiritual brothers and sisters!". The contact, however, met with mixed reactions: While many members of both communities were moved by this process, some remained sceptical. To further increase contact and interaction, the two churches "exchanged" preachers every now and then. Starting in 2007, both congregations celebrated worship together every other month. God was praised jointly, but two different assembly cultures met. For example, the ICOC brethren deliberately avoided using musical instruments at the gatherings because the traditional church had biblical reservations about musical instruments in worship. When the ICOC was looking for a new meeting place in 2010, Reiner Kallus made the far-reaching proposal for them to partially rent the building of the Church of Christ. There, the ICOC could celebrate a separate service on Sunday afternoons. Following the move in December 2010, the next step in the merger followed: Markus Drehsel was hired in early 2011 as the first joint employee; youth minister for both congregations. A look at the respective strengths and weaknesses clearly showed how much both sides needed each other. While in the Church of Christ, the well-founded biblical teaching is very much in the foreground, in the ICOC the implementation of "teach them to keep everything I have commanded you" (Mt 28:20) in the form of close relationships as companions and lived discipleship is a great strength, as well as devotion to mission. In contrast, the deep understanding of the Bible is often not so emphasized, nor congregational independence was not really encouraged in the ICOC. Admiringly Stephan Kallus says: "From the beginning I was very impressed by the openness of the members of the ICOC. This was not an integral part of our culture. "The process of growing together was accompanied by input and advice from elders and brothers of both communities. The topics developed by the leadership teams were examined and discussed in both congregations. The preachers also revised the so-called “Basic Studies” of both congregations and presented the result as a sermon series. The aim of these studies is, on the one hand, to examine and consolidate the building blocks of one's own faith based the Bible. On the other hand, they are a helpful guide in assisting a seeker on his path to becoming a Christian. "We noticed time and again that not only the common theology was important, but above all the brotherhood, living in fellowship; to have a real interest in the other, without condemning each other. That's why we asked the brothers and sisters on both sides to get to know each other better and to exchange ideas”, says Micha Brück. At the end of the process, there was a four-week pause, which was a time for fasting and prayer. God should be given even more room to show all any possible biblical concerns. Each community held its own meeting to give members the opportunity to express their concerns. In both communities, most of the members viewed the process positively and God's vision of unity came true: on 26 and 27 July 2014, the one Munich Church celebrated its feast of union. In October 2015, two elders were appointed; one from each previous church: Steve Krater came from the ICOC and Stephan Kallus from the Church of Christ. Ever since, both groups continue to grow together. With shared activities such as women's breakfasts, seniors’ lunches, children's picnics, worship nights, Bible studies, teen events and many other activities such as a Bible reading marathon (all-day open house with continuous reading), we all get to know each other better and grow in love. The music in the services is still varied: sometimes without and sometimes with instrumental accompaniment, sometimes hymns, gospel or worship songs. 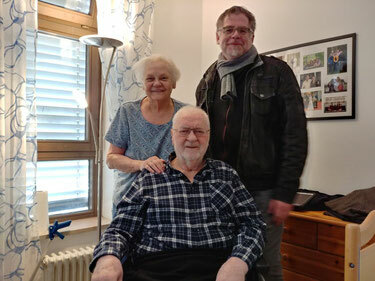 Micha Brück (r.), former ICOC preacher and now pastor of the united congregation, together with Rosel and Reiner Kallus, former CoC preacher, now retired.